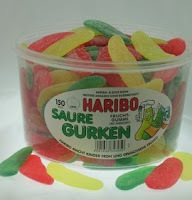 No joshing, the “Haribo Saure Gurkens” or as I like to call them – “picks” — are probably top 5 in my Haribo mind. Let’s start at the top with what you get first when you eat these things: size. They’re big. Big, like if you like to eat a lot of Haribo at one sitting, then you’ll eat 12 of them and feel like you better stop eating before you have no more Weight Watchers points left. Still , if you are like me and stop and start WW as regularly as the fog rolls into SF, then no big whoop. Next: texture. And for me – Picks textch is fun; good but not auce (short for awesome – that’s the last time I tell you that. Now you know). Chewy tough at the outset. Then moves to kinda toothsticky but starting out just plain ol’ chewy. Then – it turns way more taffy chewy. It gets…stringy-ish. Like if they were kinda warm, you could pull and pull and it’d get longer and stickier. I like. Don’t looooove. Taste: yum. But again – as I’ll probably say ad nauseum, I love me some ‘bo taste. It’s got that flavor of “I think it’s strawberry or lime or watermelon…but whatever it is it’s just so damn gummirific!” Best gummie taste around. Not fake rubbery, but kinda strong (in whatever it is), and smooth. Amount: Well if you get the tubs from GermandDeli, that’s enough for 4-5 sittings. Unless you have Jon or Scott over. Then it’s gone in 3 hours. I promise I am not trying to take this posting into places it definitely doesn’t need to go, but just how big are these things? Are they the size of a real pickle? I want to try ’em – you make them sound awesome! They’re like…2 inches long, and flat-ish. They’re delish for sure. holey toledo! i ate these as a child from the candy man in frankfurt am mein, while my dad was stationed there, and have searched for them not knowing the name…thank u thank u thank u! now i can share with my son a taste of my childhood. I recently happened upon these pickles on Amazon and thought “Shut up! Sour Pickles!” (feel free to laugh). We were stationed in West Germany prior to and right after the fall of the Berlin Wall (hence the “West” part) and we would go to the candy store off base once every couple of weeks and these pickles and the sour belts were our favorite. I ordered a tub for myself and each of my brothers (I’m the nicest sister in the world at the price plus shipping for some of these candies). Hands down these are still as good as we remember, so good that my brothers each called to thank me, we are in our 20’s and 30’s now but a thank you from them is still rare. My older brother gave them to my niece to try and I do believe we have another fan. I just wish they were more readily accessible in the U.S.
You sound like an awesome sister, Sarah. Anyone who buys anyone else a tub of haribo is good people in my book.